I am excited! The Twisted Irish Chain Craftsy class that I have had on my wish list for a long time, is on sale! I am only partway through the first few lessons and my mind is whirling with ideas. The instructor is Amy Gibson of Stitchery Dickory Dock. Her blog is one of the first ones I began to follow back when I was first began quilting and blogging. 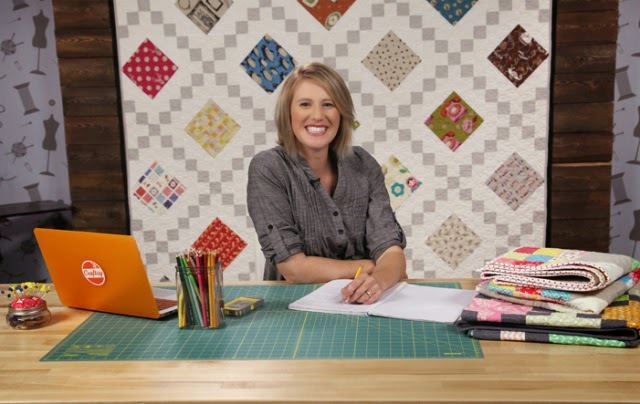 Thanks for a reminder on the Craftsy classes. I want make Fons & Porter's Emily's Wedding Quilt, which LOOKS like a double wedding ring, but is actually made of two pieced blocks, one being the 54/40 or Fight block. That block is featured in the "Magical Blocks Out of the Box" class (which is a steal at $19.99), as are a few other fun blocks. I need to improve my piecing skills and this one looks promising to help me do that! That one is on my list too! Can't wait to see what you do with it! I like Irish Chains and that fabric in the demo is SO you! I...LOVE...CRAFTSY!! There classes are great! I can't wait to see your finished masterpiece! I'm also working on a double Irish chain quilt! It's my largest quilt attempt so far -- queen size. I'm on a year long sabbatical from the project! I got burned out on it ! Lol! !